I’m back! Did you miss me? Or maybe you didn’t even notice that I hadn’t posted in more than a week… I’ll go with you missed me. 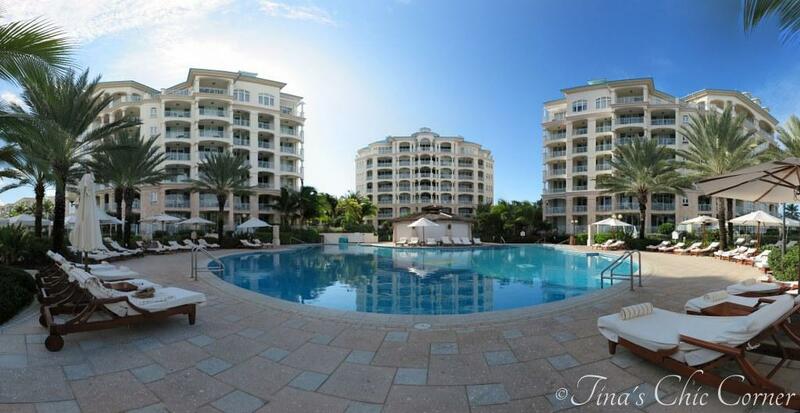 😉 My husband and I vacationed eight lovely days at the Seven Stars Resort in Turks & Caicos and we had a blast! None of these photos have been adjusted, tweaked, modified, or “shopped” in any way. That’s actually what it looks like down there. Crazy huh? Before leaving cold CT and heading to sunny Turks & Caicos, I researched the heck out of what we could do there because that’s what I do. I plan, I research, and I plan some more, I make decisions, I change my mind, I research some more, I plan some more… You get the idea I think. In general, I think you visit a Caribbean island for its beaches (or because you really like pirates or rum) and there’s nothing wrong with that at all. Since Turks & Caicos is known for their beautiful water, snorkeling is a popular attraction. They are also the home of the world’s only conch farm. After all that research, we ended up skipping the excursions entirely because we couldn’t pull ourselves away from the beach. Can you blame us? It snowed a bit back at home while we were away, but I didn’t care because snow was not in the forecast while I sat in paradise. Cold… snow? Nope, that wasn’t on my brain. 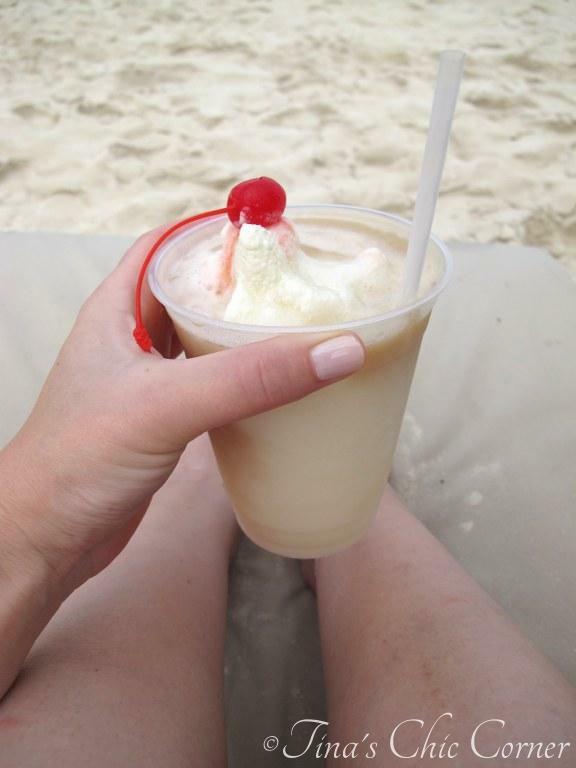 Instead, I was wondering when I was going to have my next pina colada, which by the way, was the best… ever. This was our view from our room. Part beach, part pool, part heaven. Not too shabby, right? I could definitely get used to that. I love taking pictures of clouds and did so as I lounged on a beach chair. Oh, and I read a book! I mean I actually started it AND finished it. I read Nora Robert’s Dark Witch. I enjoyed it so much that I bought the second and third book in that series. Just for the record, finishing books is not my strong suit, so that means it was really a good book. This is quite possibly the coolest flower I’ve ever seen. I’m not going to pretend I know what kind it is, but it was huge and super cool looking. These little guys were a common sight. When I first saw one I screamed a little inside me… or maybe it was out loud. They like to dart out from under the bushes and skitter across the foot paths at very high speeds. We sort of had a mutual understanding. Don’t run into me and I will try not to step on you. We named them Larry the Lizard. Yes, they were all named Larry and yes, we name creatures starting with the letter of what they are. It’s just one of those things that I started doing, and now my husband plays along too. One little Larry even followed us into our room one night! Of course I freaked out while my boo patiently captured him and released him into a bush far from our room. Thankfully we had great weather. It only rained on two days for a few hours in the afternoon. Both times we retreated to our balcony where we enjoyed room service for food and drinks. 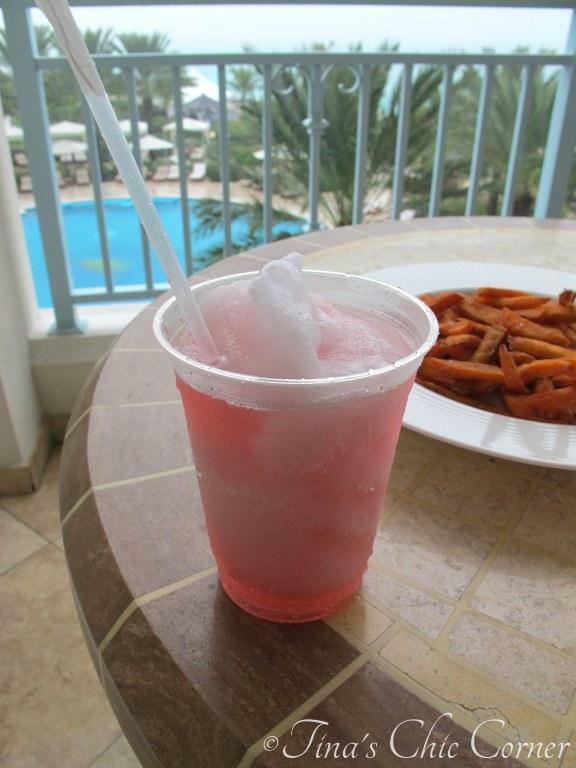 That’s a frozen cosmopolitan. Frozen?! What a brilliant idea and I definitely need to make this version at home. It might need to wait for the warmer weather to return though. It seems like all I can think about right now is hot cocoa and soup. My husband likes taking panorama pictures where you take lots of pictures and use fancy software to stitch them all together into a single picture. This picture was actually made out of 44 pictures. (The actual panorama is ginormous.) There is no one around because it was early in the morning and my husband hates doing panoramas with people in them. (Apparently they tend to move around and you end up with half people or the same person more than once in the panorama and that just looks silly.) It’s smaller than my normal blog pictures here because the panorama was so wide. We really had a blast and would love to return some day. In fact, I wish I was back already, where it’s warm, where I have no (or very few) cares, and where calories don’t matter. Instead, I’m trying to stay warm in my over sized orange sweatshirt (which was my husband’s). I’ve already got a mental list of what needs to be done before Christmas and before Thanksgiving (holy cow that’s less than two weeks away!) and my brain is already fully back into non-vacation mode. Plus, calories do matter because I feel like a stuffed sausage in my clothes. In fact you might see some healthy recipes coming up on my blog, as I try to get back on track to eating better (and shedding those cursed vacation pounds). I’ve got to hit the ground running with my holiday baking, so you’ll also see some fattening cookie recipes in the mix. Confusing, I’m sure, but hopefully you get me. What a trip, Tina!!! Gosh that looks like paradise. I also start with laundry two seconds after stepping foot inside the house back from vacation, and Mr. Nespresso and I are BFFs. Hope your reacclimation into the normal routine isn’t too tough! I thought it seemed like a while since I got one of your post emails! And what an awesome vacation! It looks completely fantastic – that view! It’s stunning! Making me wish I was planning a vacation… haha And I’m the same way – must do laundry as soon as I get home!! What gorgeous photos! And it sounds like you had a wonderful time! How could you not? It’s absolutely gorgeous there. Welcome back! I’m not a cruise person, but your Asia trip sounds AMAZING! You must be so excited and I can’t wait to see all the photos you take from your adventures. Welcome back, Tina, and what a wonderful vacation! Your photos are just gorgeous. Hi Tina – we went to T&C for summer vacation back in August. It was so awesome and the beach – I think it might well be the best we’d ever seen. I stared at the ocean for hours on end (wishing I could bottle it and take it home) and my husband and son consumed ridiculous amounts of pina colada (virgin, for my little guy)! Thanks for bringing back the wonderful memories. Just beautiful! It looks like you had a wonderful time! Such a stunning place to vacation! Sitting here in rainy, cold and autumn-cold Denmark I really wish I could go there right now! I wish I could teleport there right now! Talk about paradise on earth. I mean that looks like pure bliss. The pics did transport me for a few minutes, though. I’m seriously missing that beach!!!! !